Recipes are fluid…always evolving, always improving. And in my case, I’m always improvising based on what I have available in the kitchen. I love it when you guys find a new way–a better way–to make my recipes, and then tweet me a picture. It means that we’re having a conversation, and there’s nothing that food does better than invoke wonderful conversation. This “Faux Carb” pizza crust originally posted here on the site for the fantastic film “Fat Head” was its own adaptation of yet another recipe from Cooky’s Creations (a great low carb blog). Go visit both of these sites. I have tinkered with this crust to get it where I want it–just a tad more chewy and moist, with some added dried herbs for some solid Italian flavor components. Hope y’all enjoy. And be sure to tweet me a pic when you change it up and make it your own. Your choice of meat, veg, cheese, etc. In the above pic, I precooked hot italian sausage, grated mozzarella and fontina cheeses, and topped with arugula when fresh out of the oven. Looks really good, but my daughter is highly allergic to nuts. Will substituting coconut flour for the almond flour work here or do other changes need to be made, too? Eric, I am so sorry to hear about your daughter’s nut allergy. I have the same response to macadamias–not fun. I am not confident that coconut flour will net the same result, but give it a shot. It’s very absorbent, so I would increase the liquids and maybe add an extra egg. There are numerous low carb cauliflower crust recipes on the internets, but most I’ve found still have that stinky cauliflower odor, so I’m working on a recipe that I’ll post ASAP when it’s perfected! Eric, my son is allergic to nuts as well, and I have successfully made it with 1/4C coconut flour and 2 eggs. My family loves it! That’s fantastic to hear! (about the coconut flour, not the nut allergy) You are awesome, Carrie, thanks for popping by!! Thank you so much for posting this reply. I cannot digest nuts and all almond flour recipes are out for me. I made this Pizza last night with coconut flour, as you recommended, and it was delicious! Thank you! Oh, I LOVE hearing this, thank you, Diane!!! Oh awesome! I too and my son have a nut allergy and have been searching for a substitute for the almond flour or almond meal that a lot of recipes call for! Thanks!! then you definitely wanna make the cauliflower pizza crust! That’s a great idea–and much more friendly to those of us who have nut allergies! The Fat Head Pizza even gets rave reviews from carb-lovers. I shall try your ‘tweaked’ proportions. BTW, your directions are a lot more clear & direct than the original! Thanks, Bob!! Lemme know how it works out. Once again – great recipe hon! Made the pizza tonight…best version of a lo-carb crust I have had and I have had a lot!! Unfortunately mine did not look like yours but tasted great! It was very thin, is that right? Did not get as brown…I was afraid to overcook. Thanks Anna for all you do. Pizza was great! How do you keep it from sticking to the parchment paper? Thanks! I spray the parchment paper with a thin coating of spray olive oil or spray coconut oil. Anna – Loved this recipe! The crust was the best gluten-free crust I’ve ever had! Not only did my 2.5yr old toddler help add the toppings and gobbled it up, but she asked for a leftover slice after coming home from preschool the next day… unheard of with other foods! Many thanks – another keeper! This thrills me to no end!! Thanks, Eric! This recipe was awesome! We are pizza junkies ordering out at least once a week before starting NSNG. I just started listening to Anna on the America’s Angriest Trainer with Vinnie. My husband and I are new to the NSNG and this pizza was one of my first adventures into my newly revamped and de sugared kitchen. Thank you Anna for sharing your creativity with us, we need all the help we can get to eat better! Thank you so much, Corrine!! I love hearing from you all, it keeps me inspired to post more recipes!! Serves 3-4 depending on how big of pizza eaters y’all are! Anna, I have made the pizza three times it tastes great. However the bottom part of the pizza does not seem to get toasted as the top part, sometimes a bit raw. I think next time I will flip it and roast on both sides. Any ideas? I think flipping it is a great idea–or you can also foil the edges (like you would with a pie crust) so that it doesn’t burn the edges to a crisp but the middle can cook more. It also could be an airflow issue in the oven. This is why I pine for a convection oven. Seriously!!?? Wow!!! I made this and ate all weekend on it. My Non-Healthy eating GF even loved it! Making another double batch today to have “Snacks” for the week. Great job Anna! Thank you. Anna, do you think I could soften the cream cheese and the mozzarella in a double boiler? My kitchen is minus a microwave right now…..and I have been dying to try this recipe! Absolutely! I bet you could even let the cheese just come to room temp and that would be enough softening. Instead of tomato sauce I make a Garlic butter. Use that instead of the sauce, cheese & spinach (or any other topping) Yum! Could you give the nutrition data, especially the carbs. Thanks. Cutting out sugars and grains is more of a lifestyle than a diet, so I don’t count carbs, nor do I post carb content/nutritional data of my recipes. However, I understand completely that counting carbs can be a very important part of the process to understand what it feels like to truly lessen the carb loading we’ve all been doing when we were eating the SAD. I personally stay in a low level of nutritional ketosis most of the time, and this recipe does not kick me out of ketosis. If you are trying to get into nutritional ketosis, are new to low carb, or are sensitive to the carbs contained in almond meal and/or cheese, I wouldn’t recommend eating this recipe as there are a higher level of carbs in almond flour and cheese. Almond meal, net carb count of 4 per half cup. This recipe contains 2/3 cup, so let’s guess 6-7 net carbs on the almond meal. Mozzarella: 1 gram per 1/4 cup, so 6 grams of net carbs for the 1 and 1/2 cups of mozzarella in the crust, plus any mozzarella you put on the pizza. Cream Cheese: 1 gram per 1 ounce, and one tablespoon equals one half ounce, and there are three ounces, so let’s round up to 2 grams of carbs. Tomato sauce: 2 grams of net carbs per 1/2 cup, so let’s say 2 grams for this recipe, even though you might use a little less or a little more than 1/2 cup of pizza sauce/marinara for this recipe. So we are up to 16-17 grams of carbs for the whole recipe, and we haven’t factored in the toppings yet. I have to thank you for this recipe! I made it over the weekend and was amazed. I have not eaten pizza since starting Intermittent Fasting and a low carb/no refined sugar regime in June. I used fresh mozzarella, fresh oregano, sage, and rosemary from my garden (in the crust) along with minced garlic cloves, and then our fave toppings. I made a double batch and used parchment to line a shallow boiler pan. My husband doesn’t like cheese, so I told him that it was just a “low carb/no grain” crust and did not put any grated cheese on top of his part. He scarfed it down and happily declared it to be the best pizza he ever had. I felt the same way. And, it was the first time in my life that I have ever quit eating pizza after one good sized slice. I was full but I did not feel sick as I would from regular pie. It wasn’t greasy at all. Obviously with the calorie content, not an everyday food. But when I get that craving for pizza, I now have something that won’t make me sick with gluten and grains. You can skip the microwave step by buying and grating mozarella cheese in ball form (with liquid) instead of whole or pre-shredded. This cheese can be found in the deli section–not the dairy section, as it is a specialty item. Grate the ball moz with a food processor, because the shreds come out snow-like, and readily mixes with the other ingredients to form dough–NO MICROWAVING NEEDED. Drain the cheese before grating, or drain into a measuring cup and use–just remember to subtract the amount of “cheese liquid” from the other liquid going into the recipe, so you don’t end up with too much total liquid. Fantastic, thank you for writing this!! hi, is it possible to make batches up an leave dough frozen in freezer ready foraking pizza faster? Sharn, I haven’t tried to pre-make the crust and freeze it, but I say give it a shot–and please lemme know how it works. As for being crispy, like most homemade crusts that can get soggy if you don’t prebake it enough, this one is no different. Bake it until it’s crispy enough (but not burned) b/c when you put on tomato sauce, you don’t want it getting soggy. I just started THM on Tuesday and was sent by someone who was raving about this pizza crust! I can’t wait to try it! I just started the THM plan onTuesday and can’t wait to try this pizza for an on plan alternative to the unhealthy kind we usually eat! Made this for my family tonight. They told me it was National Pizza day. I don’t know if that is a real thing or if they were tricking me into making pizza but we loved it. The kids didn’t even complain about the low-carb crust! Success. I use grated skim milk mozzarella (0 carbs). No garlic salt (skim mozz is salty) just garlic powder and oregano. Threw everything plus 1 tbs olive oil in my Ninja blender bowl and processed. Put parchment paper on 10″ pizza pan, plopped on the dough. Put parchment on top and spread evenly in the pan with a soup can and hands (longest part) remove top parchment. Cooked crust until lightly browned, topped with homemade sugar free pizza sauce, and toppings, and then broiled for couple minutes until cheese was done. Best grain free low carb crust ever. My son is on Modified Atkins diet for epilepsy. He cant eat the whole thing but its way better than none at all! Thank you. Melissa, this makes me so happy to hear–and thank you for laying out your process! A little pizza goes a long way! Hugs to you and your family. Made this tonight. It was great! Can’t wait for the cook book! Finally tried this tonight and it was fantastic! Thank you! LOVE having pizza again! Hubby (fussy eater) and I had this tonight and we both LOVED it! The only thing I will do different next time, is to wet my hands before patting the crust out (sticky stuff!) or of course now that I have come back and read all of the comments, I could just put a second piece of parchment paper over it, LOL. I have two half sheet pans- i just put it between the two (parchment on both sides of course) and squish down- perfect circle and even every time. I wish I had an answer for you. If neither the egg replacer nor flax meal egg worked, we might be out of luck. You could certainly try it without any egg or egg substitute. that’s what I do for the cauliflower tots, and you don’t miss the egg at all for those. This egg thing is a work in progress! I love listening to you on the Angriest Trainer Podcast–you and Vinnie sure do know how to have a fun, entertaining show! I am eliminating dairy now, and I was wondering if you had a substitute for the mozzarella cheese part of the recipe? Natalie–thank you so much for your kind words! I use Daiya brand non dairy cheeses as a substitute b/c I don’t eat dairy either. 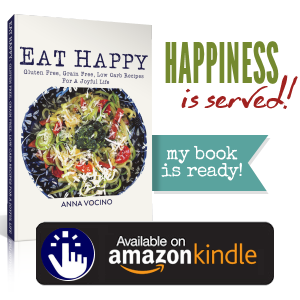 My next cookbook is “Eat Happy: Dairy Free” just for folks like you and me! please do this quickly! i NEED this! i was wondering about the daiya. thanks for the update. i would really love to have the metrics for the measurements, I use a kitchen scale and find it to be so much easier and more accurate, any chance the cookbook will have it? So sorry, Jenn! The cookbook will not have metrics, but you’re inspiring me to do a blog post to talk about the conversion amounts for my friends in the UK, Australia, and NZ! Devon, that’s AWESOME! And I love the no measuring cups–that’s when you know you’re comfortable in the kitchen! So glad you enjoyed it and got to share it with the ones you love. 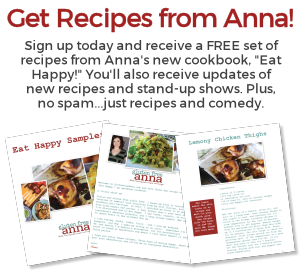 Hi Anna — thank you for another great recipe. My husband and I are new to NSNG — a byproduct of listening to you and Vinnie for a while now. Thoroughly enjoy the podcast. Your recipes make the change so do-able. That’s something I didn’t think I’d ever be able to say. This pizza is a new favorite in our home. I’m really looking forward to your cookbook in July. Many,many thanks for your dedication and hard work. Thanks to Vimnie, too, please. Annelise–THANK YOU for your kind words and for stopping by the blog to tell me as such. Encouragement like yours is what keeps me doing this and putting these recipes out there!! I didn’t have any almond flour on hand, so I substituted 1/4 cup of coconut flour and 1/3 cup of Bob’s Red Mill Low-Carb baking flour. No extra eggs. Worked like a charm! Helena, that’s awesome! I haven’t heard of Bob’s low carb baking flour–I’ll have to look into it. I really like their products. How import is the parchment paper? I made the recipe and its already go and I don’t have any parchment paper. I live a ways out of town, can I just sprayed the pizza pan or will that not work??? So I used a glass pan and sprayed it with olive oil. It worked perfect and everyone in the house loved it!! Are Almond Meal and Almond Flour the same things? I only have Almond Flour and really want to make this!! they are only slightly different, but for the purposes of my recipes, they can be used interchangeably! This is a direct link to the pizza crust recipe on Cookie’s Creation blog. I had to hunt for it because the link above is only to the blog’s landing page. When you say “blend well into a dough ball” do you mean literally in a blender or just stir/mix with a spoon? I did a blender. Dough was very wet but cooked fine. I think I need to spread it wider (thinner) and cook longer, because it came out a little too floppy. Still tasted delicious though. Did fresh mozzarella and fontina with hot sausage and arugula. Can’t wait to try it again to make it less floppy! I blend it with a wooden spoon or a spatula, and then when it’s mixed, I take over using my hands! And yes, floppy pizza can happen b/c of undercooking–I recommend getting an oven thermometer b/c most of our ovens aren’t the temp they say they are! Have been making this once a week for about 2 months. Hubby and I love it! Tonight, I tested it on my kids for the first time. I topped it with Alfredo sauce, red onion, bell pepper, and mozzarella. Heard lots of mmmm’s. I love love love hearing this! And great idea for toppings!!!! Thank you Anna. I’ve tried similar recipes but found them to be just pizza sauce between two layers of cheese. This one is much better. 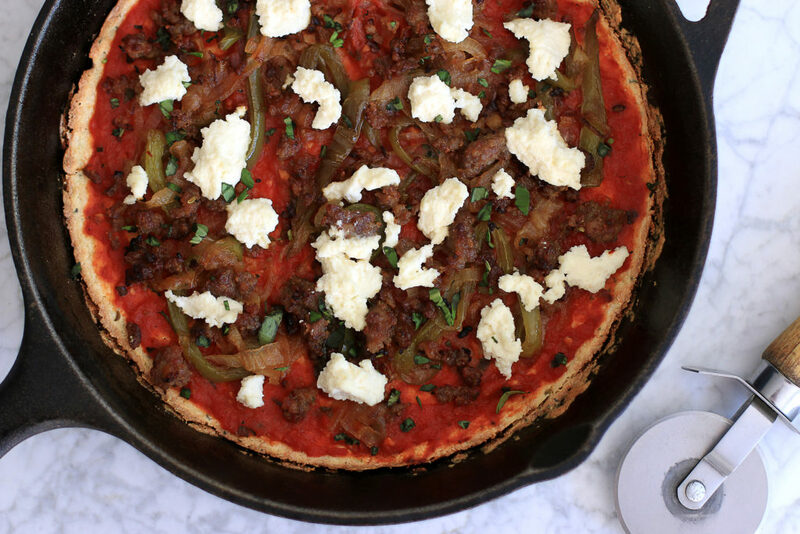 I followed the directions but used a cast iron skillet for a true deep-dish crust. Turned out pretty good. I should have used more oil and I need a smaller pan or more crust.